EghtesadOnline: The first vice president urged the government's critics to cooperate closely in thwarting the US plot to scare away international businesses from Iran's market. "The US is desperately seeking to portray the business environment in Iran as risky and insecure, and dissuade the governments and businesses from dealing with Iran by raising an alarm that big sanctions are coming … We ought to defuse this plot," Es'haq Jahangiri was quoted as saying by IRNA. He was addressing a meeting of the National Council of Dialogue Between Government and Private Sector in Tehran on Saturday. Iran clinched a deal with P5+1 (the five permanent members of the United Nations Security Council plus Germany) in July 2015 to get relief from international sanctions in return for temporary curbs on its nuclear program, Financial Tribune reported. The remaining US non-nuclear restrictions, which include a ban on dollar-denominated transactions with Iranian partners and the financing of such deals through Washington's financial system, have discouraged overseas businesses from engaging in Iran's untapped market. They have been further deterred by the hawkish stance of US President Donald Trump who has faulted the landmark accord negotiated by his predecessor, Barack Obama, and has called for a full review. Under Trump's months-old presidency, Tehran has faced a toughened US line as evidenced by several rounds of fresh sanctions. To make matters worse, President Hassan Rouhani's plans to open the Iranian economy to foreign trade and investment in the absence of sanctions have run into a domestic conservative resistance. Rouhani's opponents argue that national interests come before any lucrative foreign business deal likely to pose a risk of western infiltration. The president dismisses that argument and insists that his government is bound to step up foreign trade if it is to revive the stagnant domestic economy hit by years of sanctions. 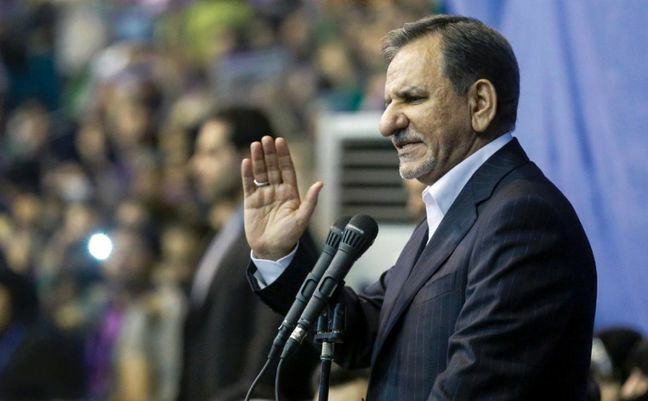 Jahangiri cautioned Rouhani's critics not to play into the hands of the US administration that seeks to isolate the Iranian economy. "As soon as we attract an overseas investor, some begin to object … If there is a secure environment, everybody will be willing to invest in Iran. Such an environment should be protected and nobody should play the game designed by Americans," he said. In its latest anti-Iran move on Friday, the Trump administration sanctioned six entities for their link with Iran's missile program. The sanctions were prompted by the test launch of an Iranian rocket capable of putting a satellite into orbit a day earlier.